While I do indeed have the necessary savings/credit etc to head off into the sunset of my european dreams, it is my essential nature to hustle like a squirrel for nuts and do whatever I can do to add to my purse. A spontaneous New Years closet purge became slightly less about a ‘shedding of material possessions’ in the spiritual form and slightly more about a ‘fattening of the wallet’ in a material form. Being funemployed affords you the time to, say, photograph all the overpriced impulse purchases collecting dust in your life. Case in point, one piece of sh*t Coach Heritage Collection carry-on suitcase, priced full retail at $648 (mind you I bought it at the outlet for less). I bought it because I had taken a business with my boss at the time who had made fun of my sturdy, roomy, if not Barney purple colored Samsonite. 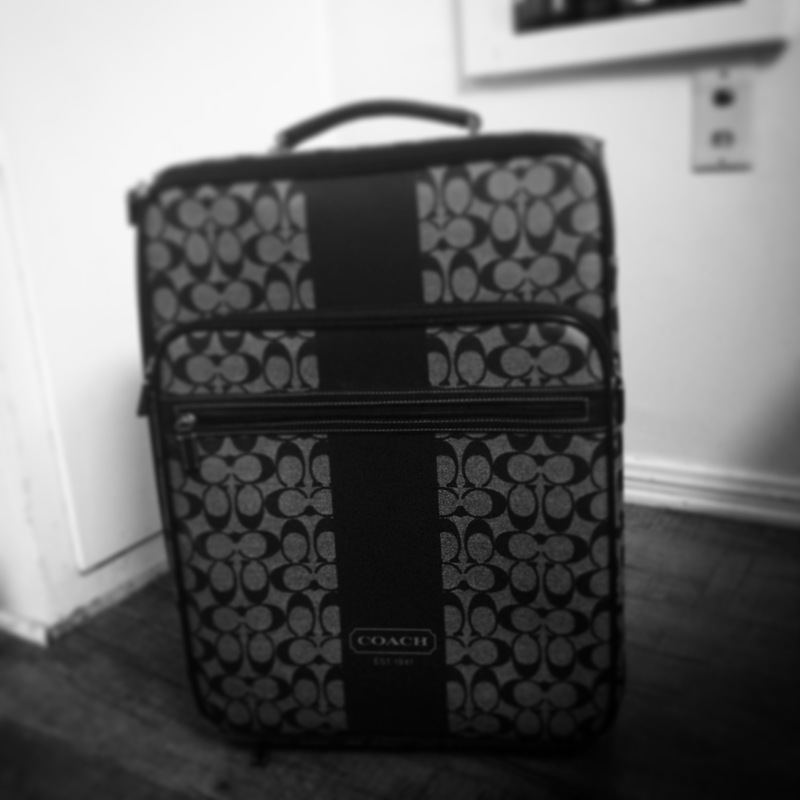 My shame had driven me to buy this fancy brand super logo-ed, utter piece of crap carry-on sized nicely for a hobbit. Carry-on was an accurate description of the thing as it failed to wheel anywhere and you had to – indeed – “carry” it. The handle extended to about mid-thigh, and at over 6ft (in heels) walking through the airport I no doubt evoked a chic, modern Quasimoto pulling a hapless postage stamp by a toothpick. As it failed to make me feel fancier or superior in life it was an easy item to part with, and I can only hope that it enjoys a future fulfilling someone of a shorter stature’s ego. The Frye over-the-knee riding boots that were so on trend and so covet-worthy online that were tragically more ‘Captain Jack Sparrow’ in person? Ebay became my new best friend! Craigslist too. Even the expensive Atomic skis I bought to learn to ski with my ex-husband back in the day… He bought them for his girlfriend. Score! My place? Subletted. My car? Rented by my carless but insured neighbor. All things must go! Fire sale! It was time to part with a particularly sentimental item, namely my wedding ring. Its been sitting in my bedside table drawer for years, silently bringing bad feng shui into my love life in all likelihood. I was never going to make it into a necklace, or a grill or whatever, and it was time to part with it. Selling it for a mere fraction of what my ex-husband paid for it struck a sad chord because I know how very poor we were, and how hard he worked to come up with the money for it. I think he might have even sold platelets to make it happen. It brought back memories of his sweetness and inherent goodness, qualities I immensely value in him still as his friend. I shall raise a glass to him from my loft in Amsterdam, which it handily paid for. Looking for a once-worn Halston Heritage boho-chic dress? Or a Michael Kors black leather moto jacket? Look no further than my eBay store! I got you, girl! (or boy, equal opportunity seller here) I may be a living late-night used car sales commercial but dammit if it doesn’t feel good. Its funny when you look around, really look at your “stuff” and ask yourself what matters. And if so, why. In all likelihood you’ll find, much like I did, a lot of it is startlingly easy to part with. As someone who values experiences over stuff, my fire sale went from being a busy-body task to a karmic/material liquidation. A transference of energy. You see, when I decided to go on this big dream trip to Europe, it might have appeared on paper to be a tad ill advised perhaps. But the opportunity would be gone, and I knew I would regret not doing it. E-ticket in hand I had faith that the net would materialize, and it has. People have bought my stuff, a close friend gifted me my round-trip ticket, the manager at my yoga studio is even suspending my membership while I’m gone. Everything is falling into place. Sometimes the world bends to your will, not unlike that floppy spoon in the Matrix, you just have to start with the dream to dare it into being.